The first time my husband and I made peposo, about 12 years ago, we added 1 TB of pepper and it was so spicy that we were laughing and crying at the same time, and I normally love pepper. Now we have 3 kids, and very little pepper goes in, but I don’t think even we adults could manage more than a 1/2 TB. You have an admirable tolerance for heat! It’s wonderful to see how busy you are, and that you will be down our way this summer. Happy new year! Yes and Yes, I am so pleased, it is going to be great – see you there. The recipe was wonderful! I thought it worked splendidly. Both of the people I served it to said it was their new favorite meal. Fingers crossed: Hope to join September’s Market to Table while visiting in Umbria. Thank you for the timely poem. Intend to post it on my FB page January 20, inauguration day here in the states. Ditto, Jane, I’d just been thinking I’d repost on the 20th too! These pictures are so elegant! Ciao, dear Rachel. I finally managed to treat myself to your latest blog post … and was, as usual, richly rewarded. Talk about “Believe” (thank you, Seamus Heaney, and thank you, Rachel, for the reminder and the encouragement) … what a journey your believing and your blog have taken you on (and us with you). So pleased and gratified that you are getting the recognition you so richly deserve. As for recipes, if you haven’t already read David Lebovitz’s post from a few days ago with a great video clip of Jacques Pépin talking about how following a recipe can lead to disaster, try to fit it in. And all the best for Heads Together, most sincerely. Oo what an exciting year you have lined up – I would so love to cook with you, sounds like those classes will be just divine! 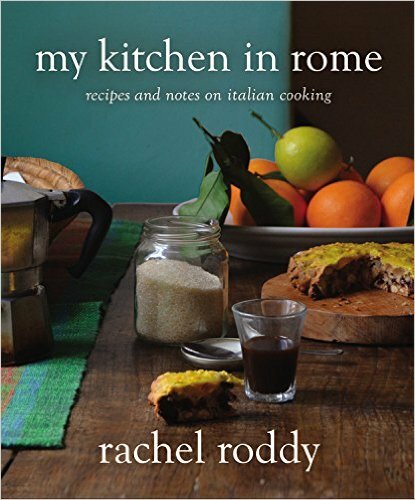 Have been enjoying your book ever so much since I met you at Honey & Co. Will be in Rome in the spring – planning a trip for my birthday! Hi Rachel! Thanks for the pasta with potato recipe, just the thing for the post-holiday winter freeze here in NY. After reading all about it, I had to know how it tasted, even managed to find smoked scamorza, which added depth of flavor to the starches. I took a photo of the results, would upload if there were a way. Grazie! I bought your book yesterday, it is just how I thought it would be. Looking forward to your next one, too. Hi Rachel, I sent you a note yesterday under “I have this kitchen” after devouring your book on same. It has an error in it, sorry! The wonderful B&B that I’d mentioned in my note is no longer running as a B&B. (Casa di Maio) Would you please remove my remark about it? I think you know my dtr, Carla Kearns, She may be contacting you to ask the same thing. Helen Kearns, Canada. Hi Rachel, I enjoy reading your stuff and I’ve just received your very beautiful “Five Quarters” in the post. I took it out of the parcel for a quick browse and it fell open at p. 282, where there’s a recipe for ‘Pinzimonio di ceci’. I see you were inspired by one of the River Café books and took the name from Rogers and Gray. But surely there’s a mistake here (the Italian in the River Café books is full of them). Surely you (they) mean “Zimino” not “Pinzimonio”? Just thought I’d mention it. All the best. I love the peposo with the full amount of pepper. It is now my new favourite beef stew. Thanks! I like your style:)…Would you please check out my blog and see what you think ? Love this recipe. Made it last week and everyone said it was so super delicious!!! Going to buy your book.